What is the Keeper of Lacrosse Project? The Keeper Project is a grassroots movement focused on protecting and promoting the values of lacrosse. It is critical that each generation who played the sport own the responsibility of safeguarding the integrity and spirit of the game for future generations. The game is in your hands. Take good care of it. Sign up here to endorse and join the cause! The purpose of the Keeper Project is to launch a culture preservation campaign and instill the six core values that are the foundation of the sport in the next generation. What are the six core values? Participating in lacrosse for the love of the game, with the pure intention of playing hard and fair while nurturing the soul, is pursuing lacrosse in the spirit of the game. Play lacrosse because you love it. The handing down of information, beliefs, or customs from one generation to the next invites you to be a part of something bigger than yourself. These form the basis of the culture of lacrosse and the character of those who participate. You have a duty to share the history of the sport as a means of continued connection, enjoyment and honoring the game for the next generation. These virtues are positive traits that are fundamental to the development of good character. All lacrosse participants - players, coaches, officials, spectators - who consistently hone these traits form enduring habits of head, heart and hand, faithful to the spirit of the game. Respect - To act in a way that shows you are aware of and fully value the participants, rules and spirit of the game means that you hold the sport’s traditions in the highest regard and esteem. Honor - To behave with high moral standards that show you fully appreciate the privilege of playing lacrosse. Honor the opportunity to participate through grace and humility. Integrity - To serve the game well means that you will act with honesty and sincerity on and off the field, undivided in head, heart and hand. Displaying qualities of conduct and attitude highly regarded in sport - fair play, courtesy, generosity, observance of the rules, striving spirit and grace in losing - is paramount. Each person, teammate or opponent, is part of the same game. Valuing the experience over the outcome serves the greater good and is integral to the spirit of the game. A joint action performed by a group of people in which each person subordinates his or her individual interests and opinions to the unity and efficiency of the group. No one is bigger than the game; it is important to recognize the team as the defining entity in lacrosse, and the reason for the game. Long after the last game, something else remains: connection, camaraderie, community. Lacrosse forges friendships, unity and family. As the game grows, you must embrace the spirit and philosophy of a shared identity. How can I support the Keeper of Lacrosse Project? The game is in your hands. Maintain the spirit of the game. Tell the story. Establish enduring habits of head, heart and hand. Honor the game and its participants. Contribute to the whole. Unite the family. Become a Keeper Crusader and promote the cause on your local playing fields. 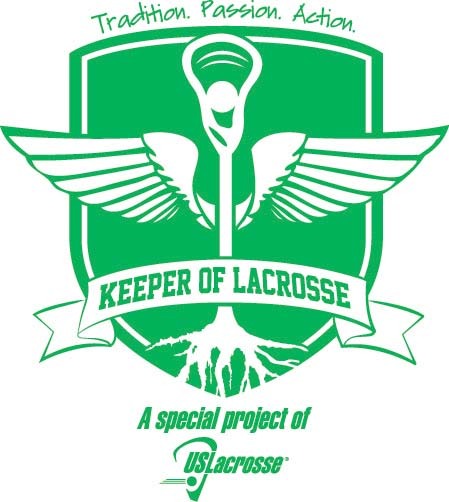 The Keeper of Lacrosse Project is a donor supported initiative of the US Lacrosse Foundation. To help fund this and other campaigns, please consider donating to US Lacrosse by clicking here.